What could be better on a New Year's Eve afternoon than a whirl around the ice at Snoopy's very own Redwood Empire ice skating arena? 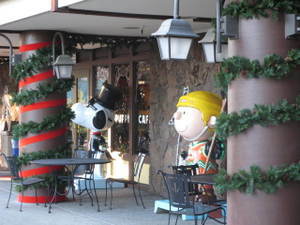 I for one, could think of nothing to compete with such a foray into the freezing realms of the late and legendary Charles Shultz's beloved Santa Rosa based Snoopy's winter wonderland http://www.snoopyshomeice.com ! Specially as there were five under thirteens seated in the Suburban in communal search of some serious post Christmas sporting activity! And skiing was out given geographical restrictions of a four hour window of group activity time. Ice skating never fails to invigorate and tripping the light fantastic at the Redwood Empire Ice Arena has an extra special zing to the tingle of active seasonal family entertainment! After an hour on the ice, the lure of hot chocolate in the Warm Puppy Cafe never fails to warm the proverbial cockles - and today was certainly no exception. It being New Year's Eve and all, it was sweet to see a sprig of fir tree set on Sparky's specially reserved table by the fireplace, simply adorned with three little red balls. So much of the late cartoonist's life has been splashed across the local, regional, national and quite possibly international press following this year's release of a controversial biography Shultz and Peanuts, by David Michealis, but the real spirit of the man lingers long into the darkening afternoon skate sessions at his beloved ice arena. A wonderful place to celebrate the drawing of an end to another year. Happy New Year Charlie Brown! Happy New Year one and all!